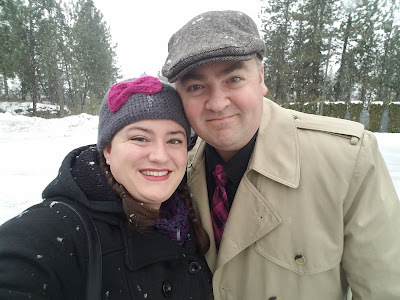 In this post, I'm going to share a challenge I faced as an admin and the solution I came up with. Imagine that you've made some changes to your Salesforce org that you'd like users to test - a new visualforce page with a few new fields, for example. You want to easily gather their feedback but the idea of assembling everyone's responses via a bunch of separate email conversations makes you antsy. Plus, you'd like a way to guide them through the testing step by step. 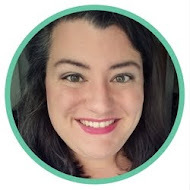 You want to make it as simple as possible for them to share their comments... because you know that will encourage your testers to actually provide feedback... which will improve the quality of your changes when you roll them out to your entire org. Now that you've got a good idea of the challenge, here's my solution: Google Forms. I created a form that outlined the process for testing and provided a text area for comments at each step. Now, after my group of testers are done, I can easily review all their feedback in a Google Spreadsheet. Note: Clicking on this button will run a custom Google Script that will copy the file to your Google Drive. You'll have to give it permission to run first. PS - I followed these instructions from the answer from Arun Nagarajan to create the Google Script that allows you to copy the Google Form to your own Drive. Handy dandy! PPS - I wrote this post on my own without prompting or compensation from any of the software companies involved. Processing the flood of available digital media can be overwhelming. Blogs, bookmarks, pins, articles, quotes, emails. Random inspiration and useful information is scattered all over the web. Evernote... allows you to organize information (bookmarks, clips of web articles, audio snippets, images, handwritten notes, etc) in digital notebooks. Find out how to get started with Evernote here. I use the desktop version primarily and pay for the premium subscription - totally worth it! I'll outline my favorite tips and tricks for using Evernote productively in a future post. Get the Evernote Web Clipper for Chrome here. Pocket... is a useful resource for saving web content for future reading. Whether I'm using my desktop computer or my smart phone, it's easy to send a link to Pocket to come back to. I'm currently using the free version. Get the Save to Pocket extension for Chrome here. Feedly... is the software I chose to review blog posts after the demise of Google Reader. I've found that I actually peruse posts with Feedly a lot more often than I ever did with Reader thanks to a layout that allows for super speedy scrolling. Feedly Pro allows you to save posts directly to Evernote, but right now I'm using the free version and saving to Pocket instead. PS - I haven't been compensated by any of these software companies. I just happen to love these tools! Logos found here: Evernote, Pocket, Feedly. Here's a tip to help you if you've got a recently updated or newly created trigger (or workflow rule) that you want to fire on existing records. 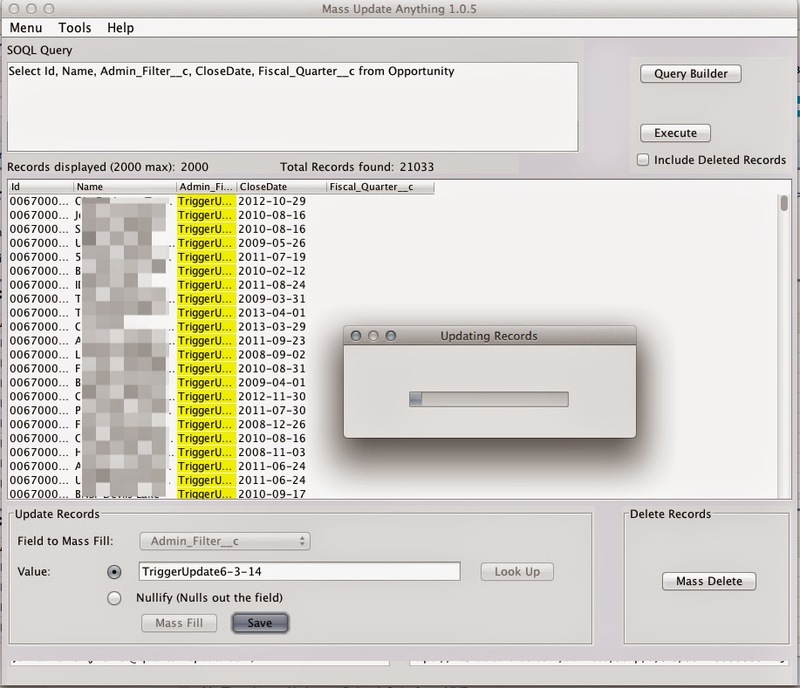 Then, use the Data Loader (or Mass Update Anything) to update that field on all of your records. Ta-da! The update will fire the trigger on all records that match whatever criteria you've specified. Now, I'm off to do this in my own org. 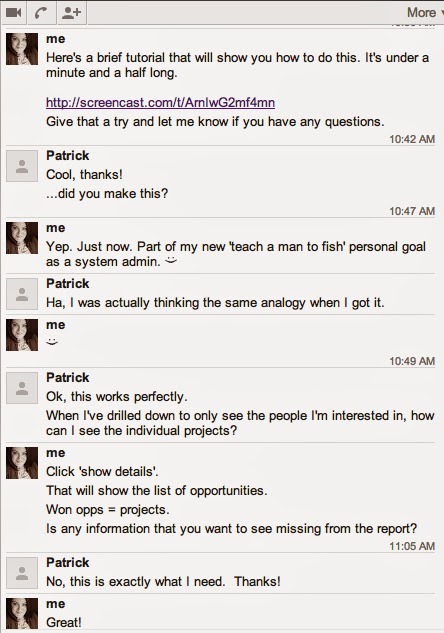 I regularly receive requests from users to create a specific report. Often these are reports that no one else needs access to. We are trying to cut down on the number of reports in the 'Unfiled Public Reports' folder. So, I'm encouraging users to save reports that they may need in the future to their 'My Personal Reports' folder. This method doesn't just benefit me by reducing the number of request I will receive in the future. It also helps my users become more self sufficient and capable. Today, a user chatted me a report request. In response, I recorded a one minute long tutorial that will help him learn the basic skills needed to prepare the report himself. That was totally worth the few extra minutes it took me to record the tutorial using Jing. I want to extract specific fields for a subset of records. I have the ids of the records that I want to extract, either from a previous export or from an exported report. But, there's really no way to extract specific fields based on just those ids. With the Excel Connector (for Windows), this is easily done by running a query based on the ids. It's also super handy for updating those fields either individually or in groups. But, as a Mac user, my options are limited. In fact, I don't know of another way to easily query a subset of records based on their id. 1. Grab your record ids that you'd like to query and update. 2. Use the record ids to build your SOQL query. I demonstrated this technique - using a concatenated formula to build query criteria - in a short video here. Drag the formula in your second row of data down. You'll get the combined concatenated criteria for your query. The last row will have all the ids ready to be copied and pasted into your query. 3. In LexiLoader, navigate to the Export wizard. 4. Choose your object, then click on 'Browse' to create your export file. I usually try to be fairly descriptive so that I can easily identify the purpose of my export. 7. Choose the fields to include. 8. Update the query formatting as necessary. I needed to add 'WHERE id = ' so that I can proceed with the next step. 9. Paste the concatenated query criteria that you copied from your last row of formulas in step 2. 12. 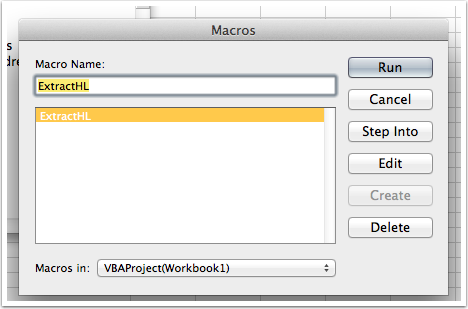 After your export is complete, open the file that you named in step 5. You'll see all of the records that you specified in your query criteria. 13. Update or use your data. When I've used this method in the past, there have been two reasons - to update a segment of records or to use them in a vlookup based on id in my original spreadsheet. There are a few different ways to do your update, depending on your circumstances. 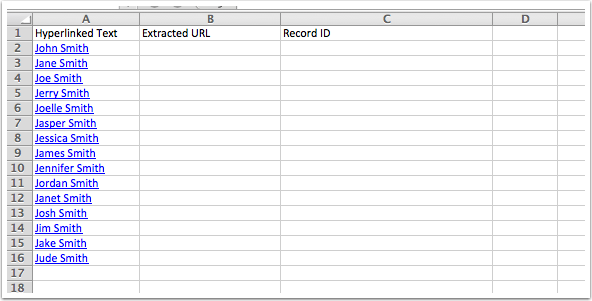 In your original spreadsheet of just ids, create a new column for each field that you want to update. Pull each column that you need in with a vlookup. This is helpful if you've already done some editing on your original spreadsheet and don't want to lose it. Use your export spreadsheet to update data as needed. 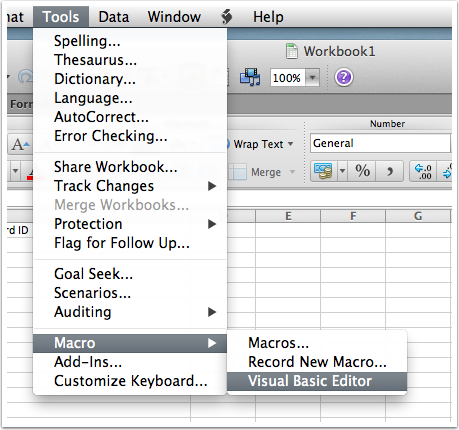 This is the best option if you haven't already made changes on your original spreadsheet. Upload your changes using LexiLoader. Why Didn't I Convert this Raw HTML Template to Canvas in Vertical Response Before Now?! For the past several years (yes years), I've been editing our Vertical Response emails directly in html. Originally, a web dev helped us create the template and then I'd just update with new content when we'd launch new email campaigns. There were nested tables 3-layers deep to maintain the layout. It looks great on the front, but behind the scenes, I was really struggling to make text and layout modifications quickly. Vertical Response has several modes for email drafting - you can use their wizard, design in canvas mode (a little WYSIWYG editor), import raw html or do plain text. 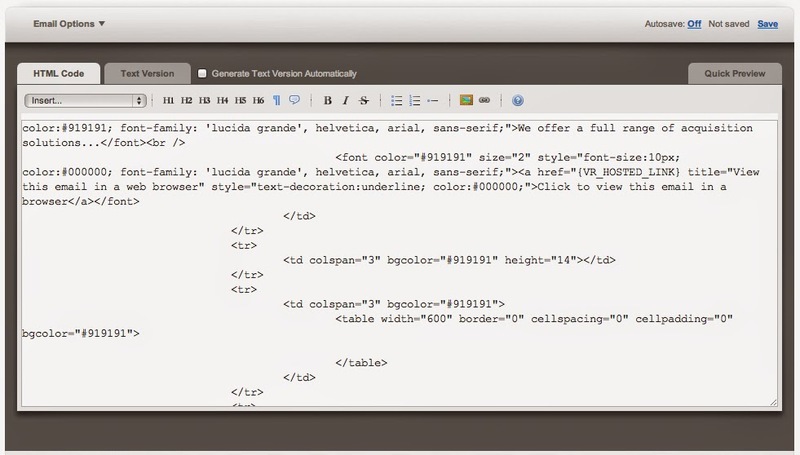 Once you choose raw html, it doesn't allow you to toggle to the WYSIWYG side. I was stuck reusing the same template and spending hours modifying the raw html. I know the basics of html but it was so labor intensive to make a small change and then double check - and if I made a mistake, I had to start from scratch because I'd saved it to preview, unless I copied and pasted a backup each time. Ugh. BEFORE: I created each email campaign by manually editing an html template for years. I meticulously recreated the template from scratch in canvas mode. I did this all visually, with the help of this tool for toggling between html and WYSIWYG to make sure I was on the right track. I opened up the existing html template on one side of my screen, and a new email template in Canvas Editor mode in Vertical Response on the other side. [Left] Recreating my template in the VR canvas editor. [Right] My original VR html template, open in a WYSIWYG editor. I manually recreated each cell in every table and formatted the background and content, making a few slight modifications to give the template a more modern look. It was rather labor intensive, but now when I want to make changes, I've got a converted email template to easily manipulate. AFTER: An canvas email template that is easy to update in the VR graphical editor! I don't know why I didn't do this sooner! 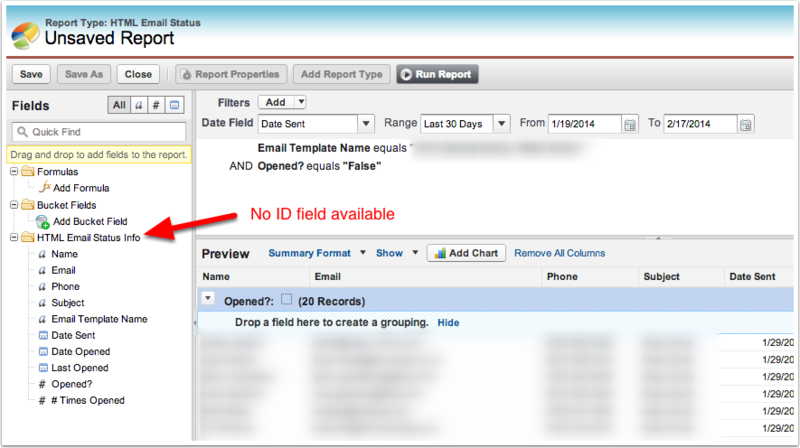 I recently found myself viewing a Salesforce report with fields that I wanted to update. But, I needed the id to do that. Unfortunately, the report was a standard report (in this case: HTLM Email Status), so my customization options were limited. So, I copied and pasted the report data into Excel. I needed a way to extract all the hyperlinks from the text so I could get to the record IDs in order to update. 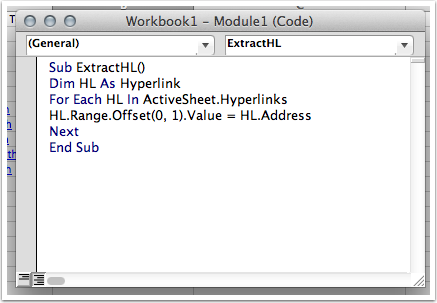 I followed the directions here to create a macro that extracted the hyperlinks. 1. Paste hyperlinked text into Excel. Add a column for Extracted URL. 2. Navigate to Visual Basic Editor. 3. 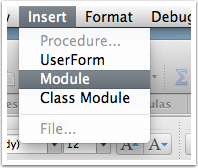 Create a new Module. 6. After the hyperlink has been extracted, pull out the record id with a formula. 7. Expand the formula for all rows. So, if you ever find yourself struggling to update records when you don't have the id accessible, but do have the hyperlink, now you'll know what to do. I first saw this handy reusable notebook on Kickstarter and blogged about it. Here's a brief video review on my experience with it so far and how I plan to use it to replace all my paper notebooks. PS - I haven't been compensated by Wipebook or anyone else for this post. I paid for it myself and wanted to share my experience. Today, a coworker asked me how to forward 86 emails at once. While researching how to respond, I discovered that you can set up a filter to forward messages, but it will only apply to emails that you receive after you create the filter. So, that wouldn't work here. To easily forward a large number of emails all at once, you can use a simple script from Amit Agarwal on labnol.org. Here is the tutorial that I created for my coworker using Clarify. I used Clarify's HTML option under 'Share this page' to insert the content of my tutorial below. 1. Create a copy of the google spreadsheet with the script. Click here to create a copy of the google spreadsheet. 2. Fill out the label and address to forward to. It's a good idea to use a temporary label that you'll create just for this purpose, eg: 'FWDTOJENNA'. 3. Click on 'Gmail Forward' in the Google Doc menu. 7. In your Gmail inbox, apply the label to all the messages you want to forward. You can click on the first message to forward and then, while holding down the SHIFT key, click on the last (if you're selecting a series of messages). This will check them all off. Then click on the label icon (it looks like a tag). Put in the label that you decide to use. Click 'Create new'. 8. Confirm the new label by clicking 'Create'. 9. Go back to the Google Spreadsheet and click 'Start Auto-Forward'. 10. The emails will be forwarded. It'll take a few minutes for a large number of emails. 11. When done, choose 'uninstall'. This will stop the auto-forwarding of the messages. Have you tried this method? or have you discovered an alternative? I'd love to hear about it in the comments. Here's an easy way to add a little flair to your day-to-day emails. When I'm sending a link to a report or tutorial, I want it to stand out from my other email content. And sometimes hyperlink-formatted text just isn't enough. 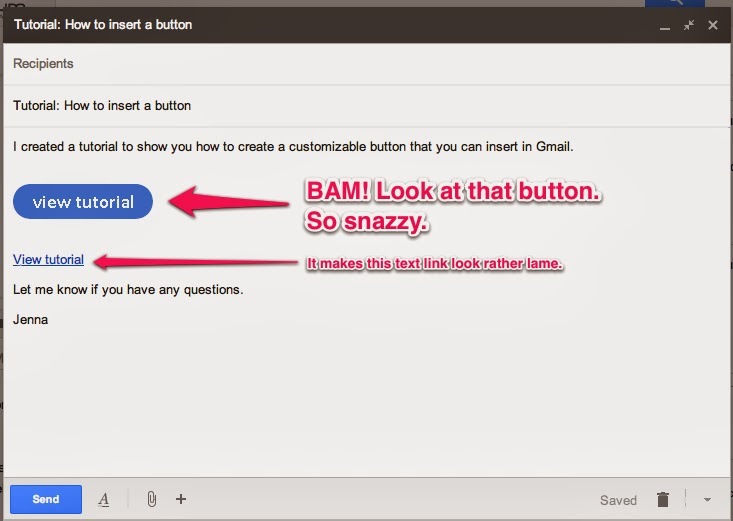 So, I came up with this little trick that allows me to easily insert a customizable button in my Gmail messages. I find myself creating these buttons from scratch several times a day, and I finally realized that I could save some time by automating most of the process. a button wizard site that I use on a regular basis: Da Button Factory. Do you use TextExpander to automate your daily tasks? Have you figured out how to tweak your Gmail messages to stand out? Share your thoughts in the comments.